Regardless of the above-stated list, the majority of divorces filed in California (and especially, Santa Clarita, California) are based on “irreconcilable differences.” Additionally, neither party can stop the other party from filing a divorce merely because they do not want to get a divorce from their spouse. If one spouse says there are irreconcilable differences and the other spouse disagrees, a divorce will still be granted. However, if the two parties mutually resolve their differences and reconcile prior to the entry of judgment, no judgment of dissolution will issue. Law Freq Legal Services understands that filing for divorce in Santa Clarita, California is a multi-step process. While the process starts with the actual filing of the “Petition,” there are many additional steps to be followed. 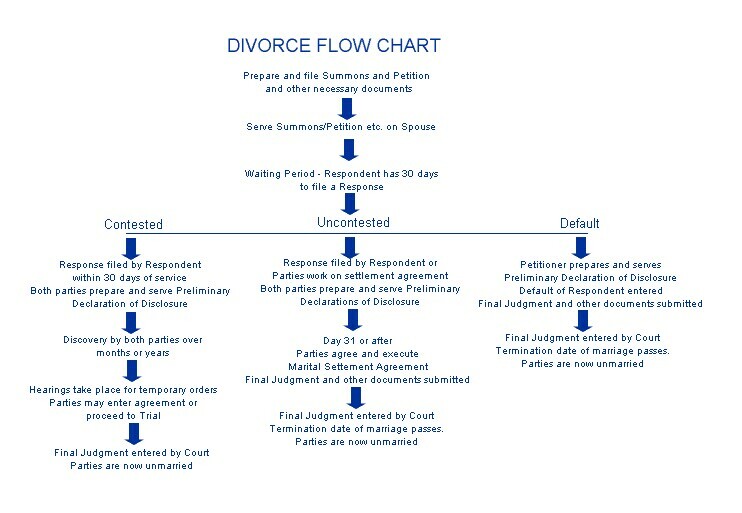 Therefore, Law Freq Legal Services has provided the following flowchart to Santa Clarita residents to simplify this multi-step process. Navigating a Divorce in California! Using the flowchart above, Santa Clarita residents can see how tiring the process can be if they are not paying attention to either court rules or practices or procedures. If this applies to you and your case and you require assistance, or, some general guidance, contact Santa Clarita’s caring legal professionals at Law Freq Legal Services. Now, that’s good advice!